decent pint of Leeds Pale and a reasonable if a tad faux pub. As mentioned handy for the station. A Tuesday afternoon visit in late November to this large pub and dining room for another GBG tick. Handily situated next to the train station in this attractive town, the Mitre is a Market Town Tavern owned pub who apparently are a Yorkshire pub chain (I was told this by a local in the pub). 7 ales on with 6 from local breweries, the other being from Okells on the Isle of Man. I stayed local for my pint and had York Breweries Oh Vienna @ 4.0%, which was very decent. The walls are plastered with beer pump clips displaying all the ales they have served here in recent times. Nicely decorated & welcoming in the main bar area with dogs also welcome. A few punters in on my visit with the food looking and smelling good. A nice pub for a stop, I may return for a longer visit the next time I’m in Knaresborough. Good spot to call at if your'e doing the Leeds-Harrogate -York railway run. There are trains to York every hour and to Harrogate/Leeds every half hour. Good choice of beers, if a little on the pricey side - £3.44 for Taylor's Landlord, £3.16 for bog standard Black Sheep, and, gulp, £9.52 for a pint of 6.9% keg Stone IPA. They will insist, as in all Market Town Tavern outlets, on using 1p and 2p's, so you often end up with a pocket full of shrapnel. It's a ridiculous system for all concerned. Very good quality beer but very expensive even by MMT standards. 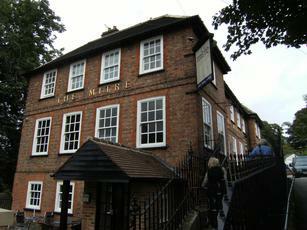 Food not badly priced for a �gastro-pub� and what we had was lovely, so tc imbiber must have been unlucky. Staff very helpful and approachable. Might be worth booking to eat � they were full when we arrived at 6.30pm on a Wednesday. A lot smaller inside than it looks from the outside, pleasant interior without any particular character; maybe a bit lacking in comfy seating. Needless to say it�s by the station, which isn�t actually all that easy to find � down the side of Carriages wine bar on the main road just as you come in from the Harrogate end. Good selection of beer, pretty nice pub.